Last Friday Matthew and I went to the Ordnance Survey’s UK Geospatial Mash-up day. And a splendid time was had by all. Really this post is just a placeholder for a link to a copy of my presentation slides (not quite what I delivered, I’m afraid), but if anyone was there and has any questions they weren’t able to put to us in person, or wasn’t there and wished they had been, then the comments section awaits…. Clearly the travel-time for a particular journey is a function of the origin and destination points, the time of travel (whether of departure or arrival), the modes used, and of decisions made by the traveller (for instance whether to prefer faster or cheaper journeys). 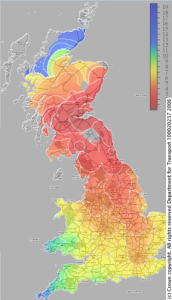 Our travel-time maps can only conveniently display a function of one point (the origin or destination point), so we need to fix the other arguments so that (a) it describes journey times which are useful to users in some context, and (b) it is practical to compute. This is off-the-shelf desktop software for planning rail journeys on the national rail network. It includes a full timetable for rail services in Great Britain. This is a website which provides uniform access to regional journey planner services operated by local councils and others in different parts of the country. It will give routes by all modes of public transport and road journeys throughout the country. This is a website which provides the same service as TransportDirect for the London area. In each case custom programs were written to drive the journey planner. For RailPlanner, this took the form of a small Microsoft Windows program which simulates filling of the text fields for origin, destination and departure time in the RailPlanner application window, simulates clicking of the button to start a search, and extracts the results using the Windows debugging API. This allows queries for routes between rail stations to be computed quickly and conveniently; because it runs on the local machine, the search is fairly fast, and a few minutes is enough to compute the journey time from a given starting location to all other railway stations in the country. In the other two cases a conventional web “scraper” was written using the WWW::Mechanize perl extension. In these cases we ask for routes between postcodes, rather than between named bus stops, tube stations, etc. We chose this approach because, while there is a standard dictionary of bus stop etc. names in the National Public Transport Access Node database, we were not confident that those names would be interpreted unambiguously by the journey planner websites. By contrast, postcodes are completely unambiguous and since most bus stops etc. are in built-up areas, nearby postcodes can be used as placeholders for their locations; we offset travel time by the assumed walking distance from the origin postcode to the nearby interchange point. Admittedly this is not ideal! The RailPlanner scraper is very fast: it can find the travel times from a single station to all the other (c. 2,800) stations in Great Britain in two or three minutes on a modest desktop PC. The web scrapers are much slower, partly because they have to call out over the network, partly because the multimodal route planning problem is much harder than for rail alone, and partly because those services are of course heavily used by people for real journey planning rather than experiments. For TransportDirect query times of tens of seconds for individual journeys are common. We limited the rate at which we sent queries to ensure that there was no adverse effect on the services for other users. Most journeys don’t start and finish at railway stations or bus stops, so we need to be able to calculate journey times between arbitrary points; these are used to estimate the time taken to get from an origin to join a public transport service, and from its destination to the final destination point. In the case of the railway travel-times, we did this by assuming that users would continue from the destination station to their final destination by taxi, taking ten minutes to change mode. Taxi journey times were assumed to be a simple function of the distance travelled—we ignore the effects of the road network, and of traffic. 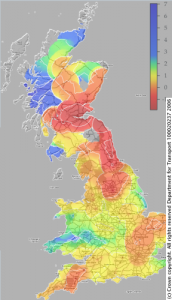 To form an estimate of this model we simulated a large number of car journeys using off-the-shelf route-planning software, and then fit a simple function to the journey time. For long distances we find that the cross-country speed is about 66km/h; while that seems slow, bear in mind that the distance in question is the as-the-crow-flies distance. We assume that people will tolerate a taxi journey of up to one hour, though obviously this is an arbitrary choice. In the multimodal case, TransportDirect and the TfL journey planners will actually compute travel-times for journeys starting and ending at arbitrary postcodes. However, it’s much more efficient to restrict our search to journeys starting at bus stops, tube stations etc., and then to compute travel times from arbitrary locations to the appropriate bus stop. In this case we assume that the user will begin their journey on foot, travelling at 1m/s cross-country; this matches the assumption made by the journey planner for the time to (e.g.) walk between nearby bus stops. We let the journey planner site determine the time taken for the final component of the journey (typically, from a nearby bus stop to the fixed final destination), since there is no disadvantage to doing so. We assume that people will tolerate a walk of up to 15 minutes at the start of their journey. Fix an origin and start time (in the case of the rail maps) or a destination and arrival deadline (in the case of the multimodal maps); and choose a region of interest; in the case of the rail maps, this was the whole of Great Britain; in the case of the multimodal maps, a square of side 40km centered on the destination. This latter is an arbitrary choice; we could pick a larger area (slower to cover), or an area which doesn’t contain the destination, for instance to ask from what parts of London it is possible to commute to somewhere outside London. Iterate over all railway stations (rail maps) or over all transport interchanges (multimodal) in the region of interest, and compute the earliest arrival for a departure after the start time (rail) or the latest departure for an arrival before the deadline (multimodal) and record it. Now we have enough information to draw the map. Do this by iterating over a grid of points in the region of interest (choosing the spacing by the resolution of the map to be drawn); at each point we search for transport interchanges within an hour’s taxi journey (rail) or 15 minutes’ walking distance (multimodal) of that point, and choose the one which gives the shortest overall journey time, if any. Record this value. This generates a grid of points at which we know the journey time, or know that no journey is possible. From this it is trivial to draw a map where each point is coloured according to journey time, or uncoloured if no journey is possible. 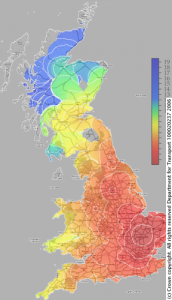 We choose the colours according to a standard scale, but adjust the colours using histogram equalisation so that each colour covers approximately the same area of map. Drawing the contours, which are essential to making the map comprehensible, is slightly more subtle, because the function to contour (the travel-time) is not actually defined everywhere in the region of interest. We fix this up by extrapolating the values of the travel time outside the domain of the function, contouring the extrapolated function, and then clipping the contours against the domain of the function. Our extrapolation is a solution to Laplace’s equation, fixing its value to the value of the travel-time on the boundary of its domain, and fixing the normal derivative at zero on the boundary of the region of interest. Though there is no real justification for this approach it produces acceptable results. 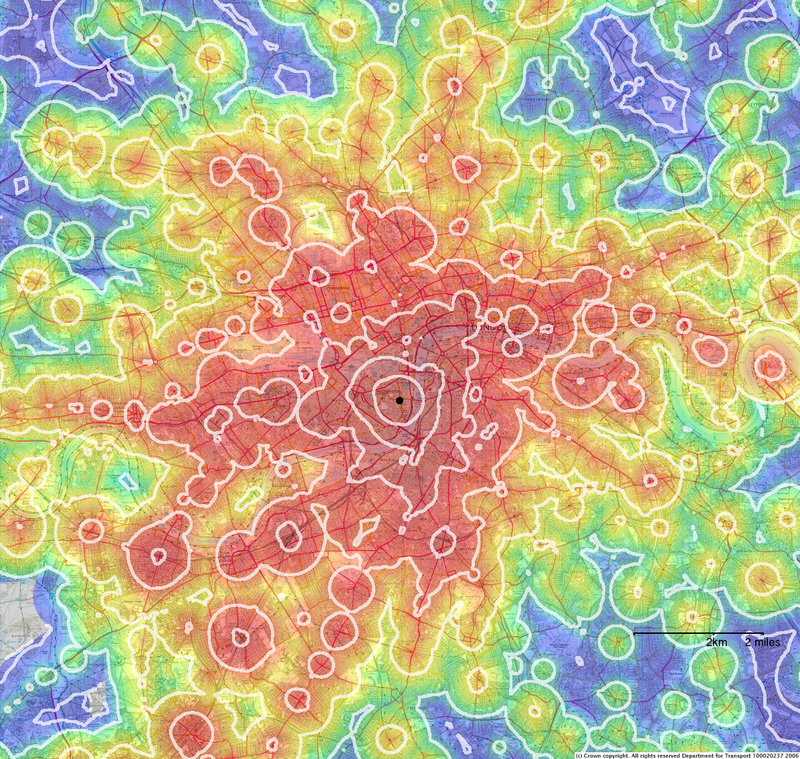 For the national rail travel maps, the coloured fields and contours were generated using the University of Hawaii’s Generic Mapping Tools, which generate PostScript output; this was then manually composited with raster base-map data in an image-processing program. 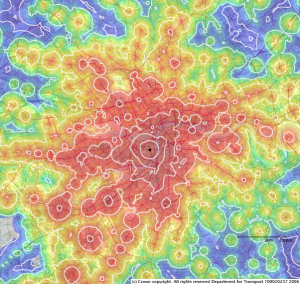 Unfortunately it is hard to produce satisfactory results by this means, so for the other maps a custom tool was developed to plot and contour maps into raster graphics files which were therefore correctly aligned with the base map data. The overlays are rendered with alpha of around 50% (adjusted by eye for contrast with the different base maps). If you’d like a copy of the custom software we wrote, or if you have any other questions or comments, please email hello@mysociety.org. Our software is available under the terms of the GNU Affero GPL. Excludes timetable data supplied through RailPlanner and the journey planning websites. For locations of railway stations, bus stops etc. Postcodes were used to describe origin and destination points as input to the two web scrapers, as described above. For use as large-scale base mapping. For use as small-scale base mapping. Click here to read and annotate a copy of their report. We get the responsiveness stats by sending each user of WriteToThem a questionnaire two weeks after their message is sent to their MP (or other representative), with a reminder after three weeks. The questionnaire asks them whether they’ve had a response from the MP, and, as a follow-up question, whether this is the first time they’ve ever contacted an elected representative. 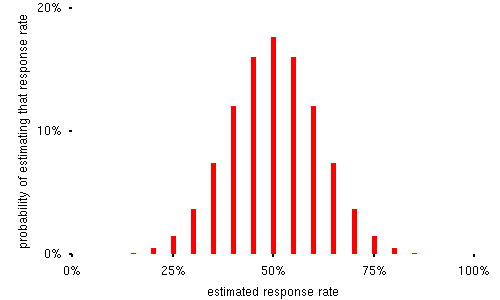 Now, an estimate of the MP’s true response rate (that is, the probability that a random letter from a member of the public will receive an answer within 2–3 weeks) is obviously the number of respondents answering “yes” to the first questionnaire question, divided by the total number of responses to the question. (Assuming, that is, that the people who answer the question at all are representative of all the people who write to a given MP, that they answer honestly, etc. etc.) So, we can regard this as being a bit like an opinion poll: we ask a sample of constituents whether they got an answer, and extrapolate to estimate the total response rate. —now the probability that our estimate will be exactly correct (10 “yes” answers out of 20 questionnaires) is only 18%, but the probability that we’ll get an answer quite close to the true value (between 8 and 12 “yes”s, or from 40% to 60%) is quite high: about 74%. It’s 95% certain that we’ll see between 6 and 14 “yes”s, corresponding to an estimated response rate between 30% and 70%. 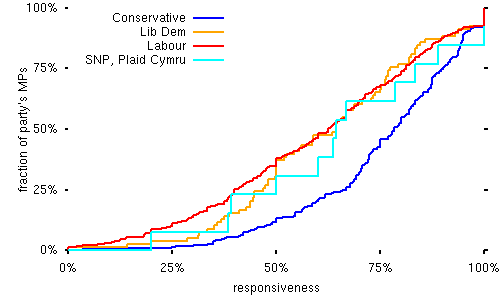 To put it another way, if all MPs had twenty questionnaire responses, and all had a responsiveness of 50%, then for about 2.5% of them (16 MPs) we’d estimate that their responsiveness was worse than 30%, and for another 16 that it was better than 70%. The [30%–70%] range is called a “95% confidence interval”, and is an indication of how sure we are about the statistics we are publishing. If you don’t pay attention to the confidence intervals you will get a misleading impression from these statistics—we show the confidence intervals for a reason! So, I’m about to start work on loading the next copy of the BoundaryLine electoral geography data into MaPit, which will give us 100% coverage of county councillors and fix some problems which we weren’t able to work around when we did this after last year’s election. But this is a tedious job and so I’m not going to talk about it now. Instead I’ll draw your attention to Ratty, our rate-limiting service, which is of general usefulness but (so far as we know) hasn’t been used by anyone outside mySociety. Our major use for it is in the anti-abuse rules in the WriteToThem back-end. I’m about to head out for lunch,so I won’t explain how the thing works in detail, but if this is the sort of thing that you think might be useful to you, leave a comment or drop a mail to hello@mysociety.org with any questions or comments. Like almost all our code, Ratty is licenced under the Affero GPL. So, a silly post for today: Postcodeine. 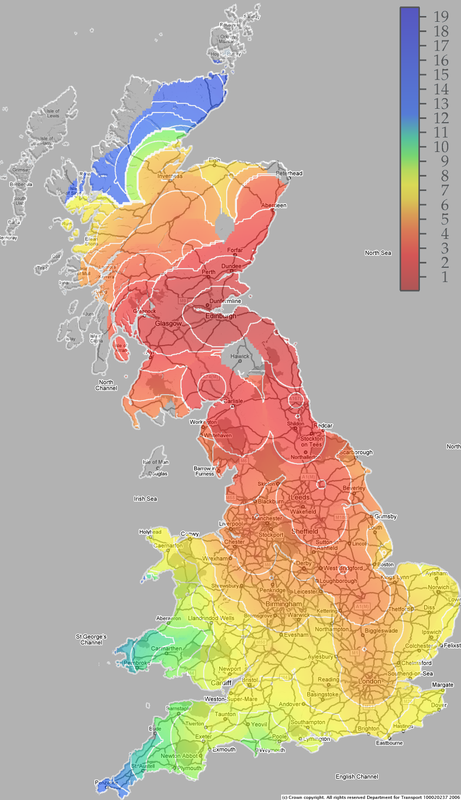 This is a British version of Ben Fry’s zipdecode, a “tool” for visualising the distribution of zipcodes in the United States. This is, as has been pointed out to me, wholly pointless, but it’s quite fun and writing it was an interesting exercise (it also taught me a little bit about AJAX, the web’s technology trend du jour). If you want the source code, it’s at the foot here; licence is the Affero GPL, as for all the other mySociety code. So, HassleMe launched today (despite mostly having been written just before Christmas). Good work by Etienne getting it all together. Today Matthew and I have been working on adding “instant-messenger” functionality to the site, which turns out to be a bit painful. Right now it seems like the most robust solution will be to use bitlbee, a proxy which allows you to interact with the various and wretched instant messenger protocols through the less varied and marginally less wretched IRC protocol. 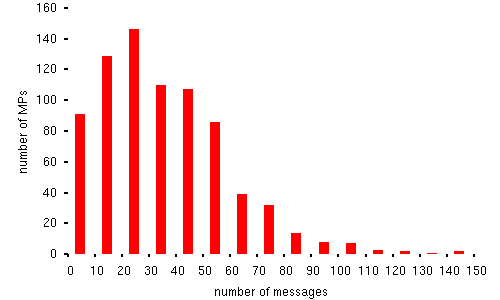 Integrating a website with instant messenger is an interesting problem. I’m not yet sure how much of the experience of building sites which send and receive email will carry over. We’ll see….